#30DayHomies Day 21 and New Giveaways! It’s Monday! Who’s off today? I am! I took the day off to take Ally to her hearing test but now that’s getting cancelled since she’s sick. So, we are just hanging out at home and Molly has her first appointment with the groomer today. That should be interesting. Today’s workout will be Nike Training App (15 minute abs) and I will get a short 2 mile run in at some point. Some fun giveaways this week from Columbia Muddy Buddy races and Nuun Optimal Hydration. Check out Sara’s post on She Cooks She Crafts She Runs for the Muddy Buddy Race entry giveaway. The entry is for any of their races, but please only enter if you can make the race. It’s open to US Residents only. Nuun sent me 2 flavors to try as part of the challenge. I had heard of them before but never tried them. They make tabs to put in your water that have electrolytes in them and they taste really good! NUUN ACTIVE HYDRATION is formulated specifically for higher intensity activities and/or higher electrolyte replenishment needs. I always drank Gatorade after a hard run or workout, especially in the warmer months. I mean the fully sugared kind, not the G2. I tried but didn’t care for it. So I kept drinking those extra calories. Nuun is sugar free and there’s 3 whole calories in it if you use 1 tab! I usually mix it up the night before because I like my water good and cold! I got the Tri-berry and Fruit punch to try, I really don’t have a favorite there, they are both really good! Since John has been “stealing” them I bought him Lemon Lime last week and he really likes it. 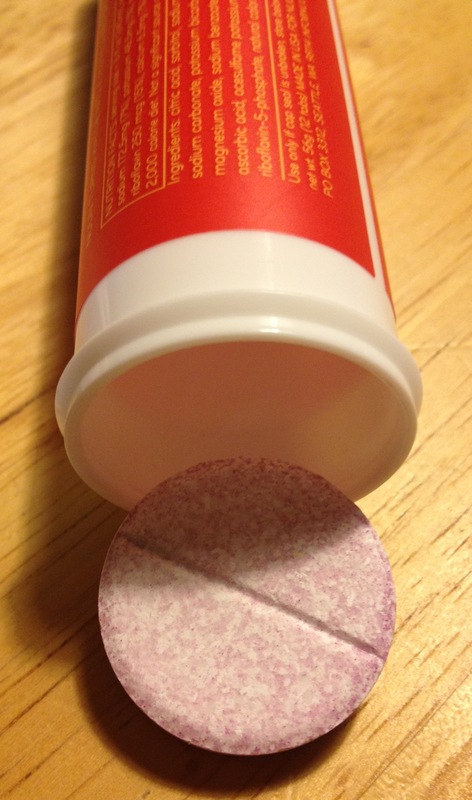 The tabs fizz a little and dissolve really quick. There are 12 tabs in each tube at about $6.00 per tube, makes it about $.50 each plus the cost of your water! That’s cheaper than the Gatorade I was buying and I don’t have the extra calories. They have a lot of flavors ~ the 3 we tried plus Citrus fruit, lemon tea, strawberry lemonade, just to name a few. You can order it online direct from Nuun or I purchased some at Luke’s Locker last week. However you might hold off on ordering until next weekend since one lucky reader will win a 4 pack of mixed flavors from Nuun! This promotion is open only to US Residents. To enter to win the Nuun Hydration 4 pack click the Rafflecopter link below. I received products free of charge but all opinions expressed are my own. What was your workout today? 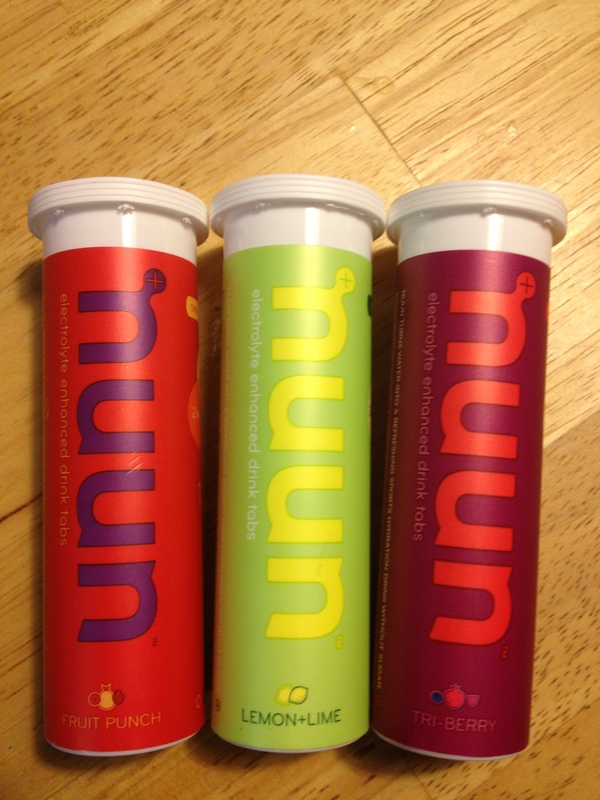 What flavor Nuun would you like to try? This entry was posted in Uncategorized and tagged #30dayhomies, how my world runs, muddy buddy, nuun, nuun review, running. Bookmark the permalink. 12 Responses to #30DayHomies Day 21 and New Giveaways! I want to try the strawberry lemon aid. Yeah!! I already have my workout in for the day. Spin class. It’s not my favorite but it burns some intense calories. It’s interesting though… I wore my HRM and that is how I determine my calorie burn….the same as I do for stair master. However, I didn’t sweat near as much nor did I feel absolutely exhausted like I do after the stairs. Thoughts??? I love Nuun!!!!! Helped me get through my long runs with a bit more ease. Plus, they’re a special treat because theyr’e so delicious! I think I would try strawberry lemonade the lemon lime usually reminds me of my Emergen C vitamins YUCK! I would like to try the lemon lime. My current fave is Lemon Tea!